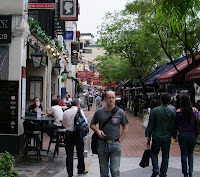 The bars and pubs are everywhere, in every corner of this narrow lane beside the river. Just pop in and say hi, 'Give me a Tiger!' Don't worry about food. That can come later.